LANSING, Mich. — As the start of deer hunting season approaches, Sen. Dale Zorn is reminding residents that there are several resources available online for hunters to help ensure the season is a safe and successful one. 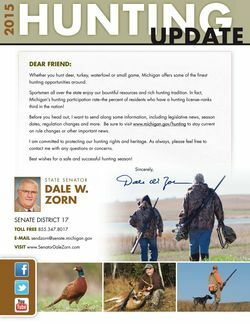 Zorn’s 2015 Hunting Update is available on the senator’s website at www.SenatorDaleZorn.com under “Publications.” It includes information on licenses, safety and the various deer hunting seasons in Michigan. In 2014, an estimated 614,593 hunters spent more than 8 million days afield. Those hunters harvested about 329,000 deer — more deer than was harvested in any other Midwest state. Hunting guides, including all current Michigan rules and regulations, can be found at: www.michigan.gov/hunting. 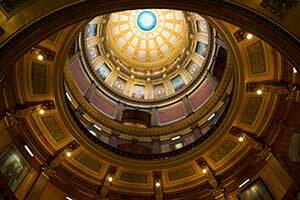 On the site, visitors can also learn about all other hunting seasons and how to get a license. In the “Where Can I Hunt” section, hunters can create and print customized routes. The Mi-HUNT feature enables hunters to view 7 million acres of state and federal public lands and printable hunting maps highlighting the vegetation of most interest to hunters.